My Mom grew up on "Incubator Hill" (mountain) between Hope and Clark Fork Idaho, the oldest of eight children whose parents were Edith and Sam. It was called Incubator Hill because of the large families. Folks on the mountain were not well-to-do like the town kids. Think, The Waltons. She actually wore dresses made of flour sacks (the sacks had respectable prints). Once, right before getting off the school bus, Harold (later my highschool principal) stole a kiss. My mom suffered great anxiety figuring that she would perhaps get pregnant from that stolen kiss. The depression came and went without much impact on my mom's family because their life didn't change that much. Grandpa kept on growing a garden, raising a cow for milk, chickens for dumplings and cutting fire wood and selling it to make money. Grandma made homemade bread, canned fruits and vegetables, made jam and washed the laundry in an old ringer washer. Grandma did have a large fenced-in flower garden which included tiger lilies which I can remember being taller than myself. Everyone used an outhouse which was a chilling distance from the house in the middle of the snowy Idaho winters. The previous year's Sears catalog served as toilet paper. I'm not sure what they used when that ran out. 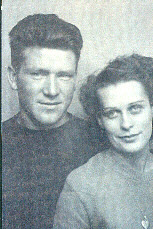 Nina married my dad, Jack, when he and her were both 19 years old. Her mother-in-law did not much cotton to the crippled poor girl (she was born with a dislocated hip) that Jack chose for a wife. Her father-in-law was more congenial. My Mom has spent her life as a hard working wife and mother. Waking up at 4 a.m. to make breakfast for my Dad (then later my step-dad) while the logging truck warmed up. She kept the books for the businesses. Kept the houses clean, placed good meals on the table, taught us not to be vulgar or talk badly about other people just because they might be different from us. She did all the stuff that society expected of her. A couple years ago Nina had a double mastectomy. Within 12 hours she was up at the hospital making her own bed. She was sent home with instructions to take it easy and keep two small pillows under her armpits and not to reach up high enough to drop the pillows. She went home and kept on doing the things she has always done. She is a feisty little 81 year old spitfire, 4'10" tall. She has to reach to do just about anything so the pillows were never used. They wanted to send some support person to help her cope. She told them to forget it. Cope with what? She healed well and fast, amazing her physician. I'm thinking she is probably just about his favorite patient of all time. Daddy was born on some island on a lake in Nebraska. If I paid attention better (or had a better memory) I would be able to give you the exact location. I do know that the family moved to Sweet Home, Oregon and that is where my Dad and his brothers and sisters (all 12 of them) grew up. His family, I'm thinking, did not have the stigma of being poor folk. I'm not sure how they fared through the great depression. My folks got divorced when I was nine and I didn't see my Dad's parents much after (or even before) that. Years later when I showed up married with a lot of kids to the huge family reunions, that Grandpa and Grandma (Clarence and Jeannette) would treat me like gold. In fact, Daddy's brothers and sisters have always treated me like gold the few times I have seen them at reunions over the years. I'm thinking that if there was a black sheep of the family, that my Dad was probably it. Tragedy and hurt feelings that never quite healed. But it is still a close family and Daddy is part of it. Daddy didn't go off to fight in the Second World War. He had flat feet so he worked in the shipyards in Bremerton instead after he and my mom got married. After that he was a logger for many years and later a construction worker. But being an excellent mechanic, he mostly has just made a living fixing other people's rigs since then. Always charging a fair price for his work. I am really proud of that fact. I like my dad. When I took some kittens that were ready to find new homes with me when leaving after one visit, the concern on Daddy's face for what the mamma cat would be feeling was real even though we had left one kitten behind for her. Read my true story, "Downy", to get more info about my dad. When we lived a long ways from him and had car trouble, I would call and describe how the car acted and sounded and he usually could actually tell us exactly what to do to fix it. "Go out and clamp the gas line with a pair of pliers while it is idling and hold it for a few seconds while the suction builds up, then release the pliers. That should fix the sputtering and bouncing at traffic lights when you are stopped." "Check way down below the alternator. You should find a little switch that sometimes doesn't quite get locked back into place and if you turn it the rest of the way the car should take hold and start." "Have you added oil lately?" Oops. My dad was working full time up until a couple of years ago. Then he fell off a truck trailer and broke his hip. Like my mom, after that he was supposed to be taking it easy and just working on small stuff like carburetors, but if I'm not mistaken, he is back to regular mechanic stuff - the only difference is it just hurts now when he does it.